Just thought you might be interested in knowing that the 1997 "Funk" or "Mike" cropcircle you have highlighted in your cropcircle section is man-made. I know the person who made it. Obviously his name is Mike (no, not me), and he told me that he did it shortly after it made headlines in the paper. He used to work for UPS, in fact he was making a delivery to the Carmike Theatres (where I was working that year) the day he told me, but I haven't seen him for a long time so I don't know if he still works for them. 's a relief in one way, but I'd still like to know what caused it" Olsen, Tres Dixon and Ryan Layton said there were no trails leading into Funk's field Friday before they entered to examine the circle and a W-shaped tail. "It was kinda neat, I've to tell you, to walk in there for the first time," said Layton, who will collect plant samples from the Funk formation and send them to former University of Michigan professor W.C. Levengood. 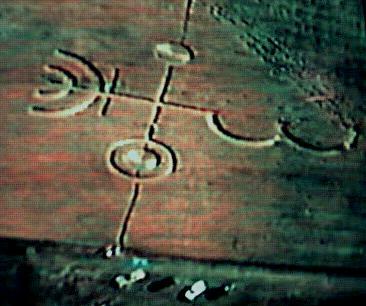 Levengood and his associates studied samples from last years Providence crop circle and determined it was "authentic," meaning it was not likely created by human pranksters. Levengood's analysis showed the barley within that circle had undergone strucual changes created by some kind of high-heat energy, as has been the case with other crop circles he's studied. Layton, Hansen and others observed Friday that the nodes on the flattened plants inside the Funk formation appeared darker than those on neighboring stalks outside the design. Layton said he spoke with Levengood's assistant,Nancy Talbott, and she said the research team has been inundated with samples from six fresh crop designs in the past few weeks. "This is going on all over the country," Layton said. Everywhere the Hansens have gone this week, people have made jokes about ET visitors. Meagan Hansen, a 15 year old sophmore at Skyview High School, said she can't say for sure what created the crop circle-- and $500 worth of crop damage-- in the field just across US91 from her home. But she does know she heard strange noises about 12:30 a.m. Sunday--sounds she now thinks may have had something to do with the crop circle's creation. " It was like two beeps or a buzz," said Meagan, who was in the basement watching TV at the time. "It was like if you put a beep and a hum tone together. It was weird. It wasn't like anything I'd ever heard before." Janet Funk, who lives a few hundred yards awayfrom the most recently discoverd crop design, wasn't worried about what she might hear. she was more concerned about what she might see-- like dozens of people trmpling her father-in-law's barley. Two newspaper photographers took to the air Friday, and Funk was afraid the curious would show up in droves Saturday. Layton who asked the Funk's permission before entering the field, was afraid his sample collecting would be hampered by human visitors. Todd and Lisa Weakland, of Ogden, spent two days this week taking samples from the Hansen formation and will send them on to Levengood. the Weaklends measured the formations circles at 74 and 31 feet in diameter. Layton had yet to take measurements of the Funk design, but said it could be 300 feet from end to end-- longer than the 258 - foot Pronidence formation. The Cache County Sheriff's Office was not investigating either of the crop circles Friday Deputies briefly looked into the Providence formation last year and determined pranksters, and possibly gophers, were probably to blame. Neither humans nor rodents were apprehended.